On the Winter Solstice, the stones at Stonehenge align perfectly with the sun. 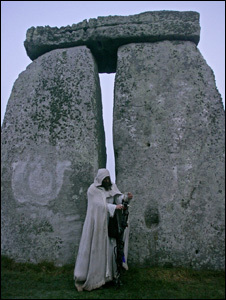 ‘Pagan’ worshippers gathered this year – as they do every year – at Salisbury Plain to mark the occasion. But those of us who missed it can explore Stonehenge in considerably more comfort – and detail – using a new iPhone and iPad app, the Stonehenge Experience. The app not only lets users explore Stonehenge in 3D, but also lets you ‘rub’ the screen to reveal different layers of prehistoric artefacts from the site – and recreates the sounds of when Stonehenge was constructed. The site uses 3D digital ‘models’ so users can do things that visitors simply can’t – such as excavating down through layers of the site to reveal artefacts such as a ‘flesh hook’ and a solid gold breast plate found at the site. All the 3D views of the site can be controlled via pinching and zooming on screen to let you ‘walk’ through Stonehenge – without the fences that usually keep visitors far from the stones. You can stand in the middle of the stones, and an ‘acoustic model’ also captures what it sounds like to stand there. The app incorporates some of the latest archaeological findings, providing you with up to date explanations of the site’s purpose, based on respected academic theory. 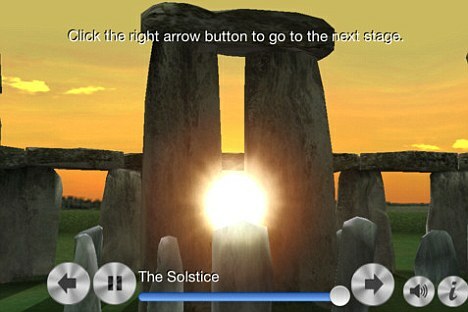 This year will see mpre than one Stonehenge app being launcehed – watch this space for details.